At the ripe old age of 5, JR's dad took him in the office and introduced him to his first roll of 15 pound roofing felt. And 34 years later, JR. had roofed on every street in Sacramento. In 1986, JR. met a Bar-B-Que man from Texas. And after looking at his bar-b-que, JR said this looked pretty similar to his tar pot. So thinking about it for a while, JR said this looked easy and figured cooking tar and cooking bar-b-que would be the same. After sampling this Texas bar-b-que, JR decided this was the best, but wanted to put it to the test...give it to some roofers (they don't agree on anything) and contractors that always think they are the best, and car salesmen looking for a good deal. They all agreed that this Texas Bar-B-Que was the best. As a result, JR opened JR's Texas Bar-B-Que in November 1987 a 20 seat restaurant on Otto Circle. Today, JR's occupies 7,800 square feet with a seating capacity of 149. 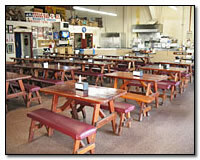 Besides the restaurant, JR does outside catering in all of Sacramento County and all surrounding counties. With the capabilities of serving from 10 to 10,000 people, JR has earned the prestigious honor of being named "BEST ALL AROUND BAR-B-QUE" by Sacramento Magazine and other publications for the past 30 years. If that's not enough, JR's Mesquite Smoked Beef Brisket stands alone as the best brisket...even by Texas standards. 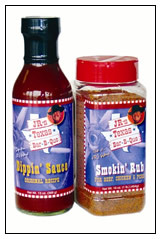 Even after 30 years, JR continues to grow and now will be offering his mesquite smoked meats (vacuum packed), dry spice rub and bottled bar-b-que sauce through distribution on the internet, other eating places and soon your local market. 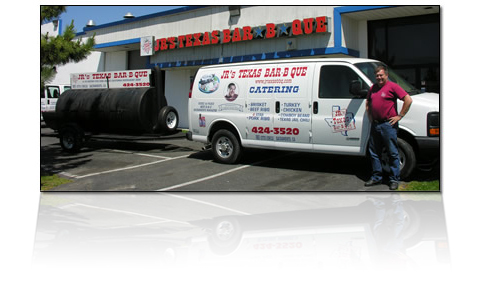 We would like to hear from you...let us cater your special event or just stop in the restaurant and say hi to JR. Sacramento has been a great support of JR's Texas Bar-B-Que and JR will continue to provide Authentic Texas Bar-B-Que for many years to come.